After twenty minutes and as many Canadian dollars, my hat, more specifically my hat band, was again in pristine condition. And the change was the unlikely outcome of a chance meeting, a smidgeon of alacrity, and the work of a true professional. I have worn hats for years. The habit started in the 80s when, along with millions of sun-baked citizens, I was bombarded in Australia by posters imploring us all to “wear a hat – prevent cancer”. Since then my head has rarely left home uncovered, and to accommodate my habit, I must have gone through dozens of them over the years. Most end up being lost rather than wearing out. But there is an exception – my Panamas – which need replacing every year. The problem is that the straw frays where my fingers hold it when doffing. I reflexively raise my hat when I meet people, and not being of hard-wearing leather or felt, as might be the case in Australia, after a while these particular hats wear thin. Renewal usually occurs in the spring, and each year it is off to Marks and Spencer’s for my next ‘genuine article’ or so the label declares. Three qualities determine my choice. First, the hat’s size – it must sit comfortably. Second, the presence of a sweatband – forget the sweating, without a band the straw scratches. 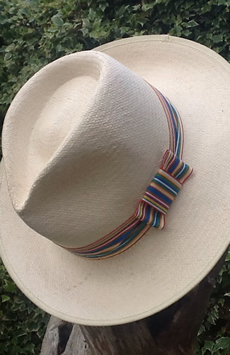 Third, the style of the decorative hatband above the brim – this requirement is my one indulgence. Finding a hat of the right size and with a sweatband is usually easy. Finding one with a ribbon that appeals is a real challenge, and the choice this year was dire. In the end I bought one whose ribbon had a dull, blue, Paisley design which I hated from the start. The ribbon had to be replaced, and eventually I found just what I wanted in the local cakeware shop. The ribbons on offer at the more traditional stockists were too narrow, too floppy, or just dull. My cake shop purchase was wide, firm, and with a chirpy, predominantly yellow and blue, rainbow design which would do the job nicely. However fixing it on to the hat wasn’t easy, and even with my wife’s skilful sewing fingers the band rucked up. Nevertheless, it was a major improvement on the original and I was happy. Then, a few weeks ago, I was sitting having tea at my Canadian B & B [see A perfect foil, 7 July 2013], with my Panama resting on the arm of the chair. The woman opposite, who had noticed the hat and who already knew that I planned to spend a day in Toronto, urged me to go to ‘a most wonderful hat shop there’. She gave me the address, and somehow the details of this “not-to-be-missed” milliner stuck in my mind. The shop happened to be just round the corner from where I was staying and the window display was indeed beautiful. The hats were like exotic birds. I walked past it twice and on the third occasion found myself wandering in. I had no intention of buying anything and explained this to the owner, adding that her shop had been recommended to me, that the hats in her window were a delight, that I wanted to look around if possible and that my grandmother had been a milliner in London after the Second World War. 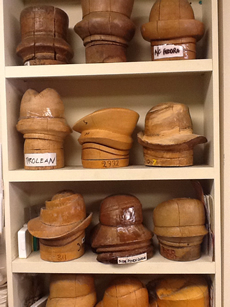 Karin welcomed me in and invited me to explore, even letting me peep at the workshop where the spectacle offered by the shelves of hat blocks was a special treat. She kindly responded to my questions of which the last, after a flash of inspiration, was ‘Could you possibly straighten the ribbon on my Panama?’ She examined the said band and told me that it was certainly do-able but would cost and could take half-an-hour. I accepted straight away. I installed myself on an overgenerous sofa and admired the shop display, passing my time watching two customers puzzle over possible buys; one to be worn for fun, one for a special occasion. Then I was called over to the work bench. The ribbon, with its fancy bow, had been pressed and re-attached and now there was no wrinkle in sight. I was delighted. I paid, thanked Karin warmly, and made my way to the door. As she saw me out she commented, “By the way, that ribbon was of real quality, we loved the pattern and width, where did you get it from?” On hearing I had bought it in an English cake shop, she looked bemused, so I recounted the story. Apart from taking in the quirkiness of the idea, she had to resolve a conceptual problem – cakes in Canada, unlike in the UK, aren’t decorated with ribbons. But that was a minor issue in milliner terms. We shook hands and I left smiling. It seems that the poster in Australia and some chance advice over coffee in Canada had worked their magic. Perhaps, sometimes unsolicited advice does make a difference. What was the name of the hat Shop in Toronto? I’d love to visit it. The name of the shop in Toronto is Lilliput Hats at 462 College Street. Talking of shops, the place in West London that I bought the ribbon is the Bakeware Studio at Kooks Unlimited and is at 12c Eton Street, Richmond. By the way, if you happen to visit either could you remember me to them!